This six bedroom contemporary villa is an elegant merger of Caribbean architecture and European style with modern amenities and technology that will please even the most discriminating technophiles and traveler. (See Villa Features). Anticipation is privately nestled on the hillside with an uninterrupted panoramic view of the Caribbean Ocean. Arguably one of the best positioned locations at Tryall Club. As you enter the luxuriously appointed contemporary styled living room with its soaring cathedral ceiling, you are immediately presented with Anticipation’s spectacular view. 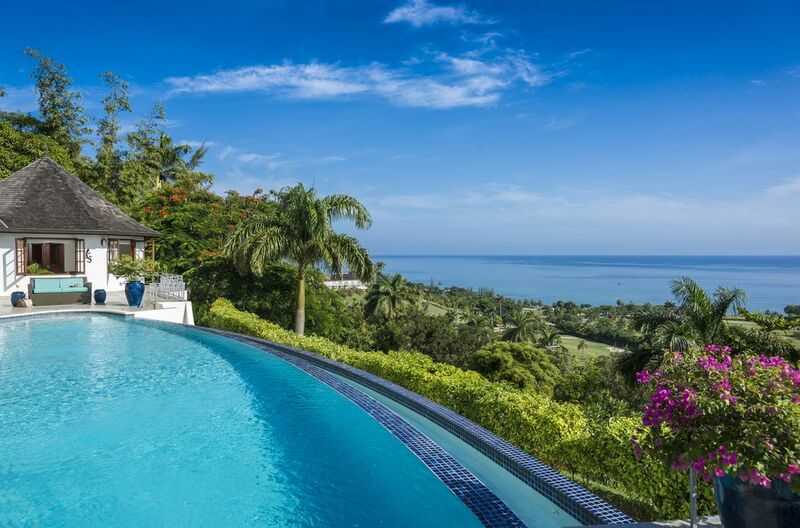 It is one of only a few villas that can boast both a sweeping view of the Caribbean Ocean and the renowned Tryall golf course. Anticipation’s six bedroom suites are tastefully appointed and air conditioned with custom furnishings and luxurious bedding. Each bedroom and en suite bathrooms feature stone flooring and state of the art bath fixtures. * Tryall's Golf Course measuring 6,221-yards, par 72 course is considered to be the finest in the Caribbean and is the pride of Jamaica. It attracts the game's leading players and prestigious international events including the Johnnie Walker World Championships, Mazda Champions, Jamaica Classic and Shell's Wonderful World of Golf. This world class golf course boast hillside and seaside fairways. In-house greens fees offered to the villa's guests. * Sea Kayaks which accommodate up to three people are also available at the beach. * Tryall's watersport center can arrange for all your diving needs as well as opportunities for water-skiing and tubing. Fees may apply. * Great House Restaurant for continental and Jamaican dining if you wish to dine away from the villa, with its outdoor terrace. * Play tennis on 7 Nova Cushion courts, which are lit for night play. * Kids Club, keeping the kids happy. Children are entertained, cared for and close at hand. The Kids' Club offers daily activities which make full use of Tryall's amenities and the expansive grounds of the estate. * Friendly, caring and professional babysitters are available for hire for a few hours or full-time service. Look out at the Caribbean Ocean right from Anticipation Villa. Beach is just a short 5 minute ride in one of our golf carts! Look out onto the World renowned Tryall Club Golf Course. NOTES: Laundry Room - service completed by laundress. Outside, lounge chairs provided Full Staff: Housekeeper, Chef, Butler, Laundress, Gardener Your Head of Household, Avis, will oversee all of your needs (requests for nannies, grocery shopping, etc.) just ask. Your housekeepers, Marsha and Glenda, will care for every detail of your bedroom and bath, providing fresh linens and turn down every evening. No need to over pack for your visit to Anticipation since clothing will be washed, ironed, folded and returned to your room daily by Dorothy, your laundress. Anticipation Villa's beautiful plants, flowers and grounds are impeccably maintained by your gardener, Nordia. Nordia will provide fresh flowers for each room and will provide Chef Fitzroy with fruits and spices that may be in season from Anticipation's own garden selection. As you relax by the pool, your Butler, Gregory will be a warm familiar face during all of your dining experiences at Anticipation. The views at Anticipation Villa are outstanding. This is why you come to Jamaica!! When I am on vacation, I want to relax and not have to think about any kind of work. While at the villa, everything was taken care of. My clothing was washed and pressed, the chef always had something great cooking in the kitchen, and any need or question I had was quickly attended too. My family and I can not wait to go back! Our destination wedding at The Tryall Club Anticipation Villa was a dream come true and the 4 day celebration was more than what we Anticipated making our special day “A Wedding to Remember”. The day of arrival, the Anticipation Villa staff greeted us at the beautiful waterfall entrance with cool mint towels and glasses of champagne. We were amazed at the beauty and elegance of the 6 bedroom contemporary villa with stunning views from every room; the villa was much more than what we anticipated. The loving staff was very attentive and detailed-oriented making all 15 houseguests feel as if they were home. Chief Fitzroy’s meals were divine; all of them delicious, very tasty and never repeated. The staff was very excited about having the wedding dinner reception at their villa. The breath-taking panoramic ocean view from the terrace with the romantic fire pit adjacent to the beautiful infinity pool created the perfect romantic ambience for our outdoor dinner reception of 50 guests. Chief Fitzroy prepared a scrumptious reception dinner followed by a live flambé crepe station with caramelized pineapple or banana in aged Jamaican rum. Our wedding guests can’t stop talking about their wonderful experience at Anticipation Villa making our event “A Wedding to Remember”. Anticipation is an incredible place to spend a vacation! We enjoyed the finest food, relaxed by the pool and beach. Our staff took care of us like we were family. None of us wanted this week to end! Our stay at Anticipation Villa was a lifetime experience. We absolutely loved it! It’s like staying at a Ritz-Carlton or a Four Seasons. Anticipation Villa is perfection, starting with the magnificent view of the ocean, its exceptional 6 master suites, the beautiful infinity pool, championship golf at the Tryall Club, a beautiful private beach, sailing, spa treatments at the Villa, gourmet cooking classes, yoga and a casino night are just a few of the activities we enjoyed. The staff of 5 catered to every need from gourmet meals prepared by the former Ritz Carlton executive chef, to poolside beverage service, daily laundry and concierge services. Anticipation Villa exceeded our expectations and left us speechless and we already booked our next visit! Anticipation is perfectly named. Our group couldn't wait to get to Jamaica and we were welcomed with a beautiful home, wonderful staff and the best view at the Tryall Club. It is positioned perfectly on the hillside of Tryall Club allowing easy access to all amenities at the club while providing a breathtaking view at breakfast lunch and dinner! The staff at Anticipation is superb; combined with the home and view provides a product second to none. I hope to one day have the chance to experience Anticipation and Tryall Club again! Wow, what a beautiful place to be. The view is spectacular. The staff are so lovely and helpful. The food is amazing, what a luxurious way to spend a vacation. Truly relaxing when you really do not have to worry about any detail once you arrive. This was the best vacation I have ever taken. I have recommended this to everyone who asked! So lucky to have been able to stay here. Thank you! Rates include Government Taxes. Tryall Club Temporary Membership Fee Tryall is a private club whose members may use all Club facilities and programs at no extra charge, with the exception of golf. Amenities include tennis, beach, water sports, the fully equipped gym, the Kids club, Great House afternoon tea and special events. Beginning March, 2015, the Tryall Club now requires all villa and condo guests to become members during their stay via a Temporary Membership fee of US$130 per week for each guest 16 or older, or US$26 per day per person for stays of less than seven days (inclusive of tax). This policy applies to bookings after March 30, 2015. Plan to pay your Temporary Membership Fee locally at the Front Desk in the Great House when you register. Credit cards are accepted. You will be given a temporary membership card to enable your access to Club facilities. A $1500 Damage Deposit is required at the time of check-in. If there are no damages found, following your departure, your deposit will be returned to you. Suggested tipping is $50 per occupied bedroom per day in U.S. Cash. Rates quoted are for a 6 Bedroom Rental. Anticipation Villa is also available to be rented with 4 or 5 Bedrooms, please inquire for rates.